Sheltering Tree is still one of my favorite sets in the Occasions Catalog. I love all the little components that make it perfect for all four seasons. This card was inspired by Jason Casper and with the video help from Julie Davison, it turned out great. My Stamp Clubs loved making this one! Stampin’ Up! sincerely hoped that the Butterflies Thinlits Dies would have arrived in time for Sale-a-bration, and when that didn’t happen, we hoped they would be here in time for our Free Shipping promotion. Unfortunately that was not the case. Originally they were scheduled to arrive by April 8; we then received notification from our supplier that although the ship had reached the west coast port, the container containing the Thinlits was still on the ship. We have since received verification from a third party that the vessel is still in the port--and though it docked on Friday, April 3, the container with the Thinlits has yet to be pulled. Because the container has yet to be discharged from the vessel, the soonest the Butterflies Thinlits will arrive in our warehouse is the beginning of the week of April 13; our best estimate for orderability, based on this information, is April 15. We realize that you may be disappointed you were not able to purchase the Thinlits in time to receive Sale-a-bration rewards – especially on the discounted bundles. 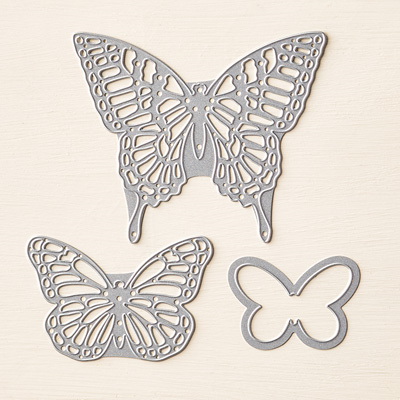 Therefore, from the day Butterflies Thinlits are again available through April 30th, Stampin’ Up! is bring us two special offers. Get the Butterflies Thinlits at a 15 percent discount--just $21.20! Buy any of the Butterflies Thinlits Bundles at the already-discounted price and choose one of three FREE Sale-A-Bration items (only available while supplies last)! Hopefully this will be it and the Butterflies Thinlits Dies will be flying off the shelf! During the month of April, for all orders of $35 or more to my online store you will receive this tutorial on how to create this darling Pink Painted Petals Purse and the four 3 x 3 Love Notes that go inside. After you place your qualifying order, I'll send it to you via e-mail. Paper Pumpkin for Mother's Day! Put A Handle On Your Stamp Cases! Stampin' Up! Retiring List is Here! This Week's Weekly Deals & Free Shipping! Tiny Treat Boxes & FREE SHIPPING WEEK is coming! My April Gift to You.